We’d love your help. Let us know what’s wrong with this preview of Hearts in the Storm by Elmer Seward. Struggling with loss and regret, Trista sets out for North Carolina’s Outer Banks, hoping to find peace in her stormy life. Fate and an old golden retriever set her on a path toward healing with an unlikely hero, the man that the locals call “Duck.” Despite his careless and irresponsible behavior, Trista is drawn to him. Trista discovers that Duck is haunted by the ghosts o Struggling with loss and regret, Trista sets out for North Carolina’s Outer Banks, hoping to find peace in her stormy life. Fate and an old golden retriever set her on a path toward healing with an unlikely hero, the man that the locals call “Duck.” Despite his careless and irresponsible behavior, Trista is drawn to him. 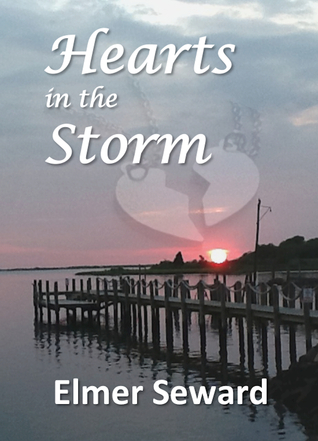 To ask other readers questions about Hearts in the Storm, please sign up. Throughout my entire life, my mother has always had a one sentence fits all solution to any situation I seemed to find myself in when it came to feeling sorrow or loss. Whether it was enduring what I thought was the greatest heartache I would ever know in the fifth grade when the boy I liked didn’t return those same feelings, to being all grown up on the outside, but still feeling like that fifth grader on the inside and feeling like you somehow still don’t measure up after a series of unfortuna Throughout my entire life, my mother has always had a one sentence fits all solution to any situation I seemed to find myself in when it came to feeling sorrow or loss. Whether it was enduring what I thought was the greatest heartache I would ever know in the fifth grade when the boy I liked didn’t return those same feelings, to being all grown up on the outside, but still feeling like that fifth grader on the inside and feeling like you somehow still don’t measure up after a series of unfortunate losses, my mother would always gently whisper to me, “Honey, I know that what you are feeling right now feels like the end of the world, and that you are all alone, but look around you. The world has not stopped turning and you have never been alone. You are neither the first nor the last to feel the way that you do. Everyone has something.” Those last three words have stuck with me my whole life, even in moments when my mother hasn’t been able to offer me comfort, her words from so many years ago still do. In Hearts in the Storm by Elmer Seward, the theme of broken hearts is explored with such literary finesse and heart wrenching story-telling, and if there were anything I could say to the characters within these pages, it would be that everyone has something. Seward has an unmatched talent for showing the vulnerabilities of the human heart and all the different shapes and shades it creates and the shadows that seem to haunt us as a result of having lived life. No one comes out of this world unscathed, yet it is our human nature to want to hide the hurt and deem them flaws. We relegate ourselves to traveling the path of a wounded soul alone, deeming ourselves unworthy of being the recipient of anything good until out scars have faded and the gaping gashes have healed. But Seward has such insight into the human condition that he shows that no matter who you are or what you have been through, there is never a moment that you are not worth the very best of an emotional life. Just because life has happened in a way you did not expect, does not mean you did anything to deserve it. We are the victims of a fickle universe, not the exactors of ever y aspect of our lives. By way of his characters, Seward breaks open the already broken hearts in his work, so that the crack can be large enough to let love back in, not simply let grief and self-shaming seep out and by connection he shows us how to break our hearts open and allow love to come back into our lives as well. Seward’s capability for creating characters that you want to get to know is spectacular. From the very first page, you are intrigued by the nature of Duck, when he experiences his nightmare, and then on the very next page acts as a mischievous young boy when his sister comes to the house to check on him. Duck is controlled by his past, and lives his life in a way that demonstrates as much. Trista as well lives a life governed by her past, and when it is discovered that she has taken up residence next door for a little while, we wonder what kind of relationship is going to form between these two characters from there very first interaction together, which is refreshingly not the normal meet cute that so many other authors rely on as the perfect meeting. Theirs is so awkward and uncomfortable for both parties that it reeks of authenticity which sets the tone for the rest of the work. This book seethes authenticity, and its stormy winds carry with it the fragrance of a fresh perspective. Throughout the story, small flashes of the past of each character are revealed. Normally I am not a huge fan of a flash back structure, because it just never felt genuine. I have now read a book that can slow in and out of time and space and still truly feel genuine and connected. The flashbacks keep you on the edge of your seat and always leave you wanting more, encouraging you to turn page after page until you have forgotten you are turning pages at all because you are lost in the emotional peaks and valleys of these characters lives. When suddenly all is revealed, you feel like the wind has been knocked out of you and yet a burden has been lifted from you all at the same time. This is a book that takes you on a journey of your own alongside these characters as they are on a journey of discovery of their own. Seward does a fabulous job of transferring what his characters are feeling from the page into our hearts, and that is the reason us readers even pick up a book to begin with. I also appreciated the parallel of the storm coming to shore in the Outer Banks, and the storms that were raging inside the characters. That detail was a stunning and perfect bow to encase such an immaculate work. I am obviously all about the meaning of things over here at The Moral of Our Stories, so the purpose that this book is trying to accomplish directly lines up with what I love. This is writing for a purpose, not simply writing to tell a story. I feel that Seward did not simply set out to write a book, he set out to help mend hearts, and I feel that he has done just that. I give this book 5 out of 5 morals, and would recommend it to anyone and everyone. There was not a single thing about it that I would change, which is high praise coming from this nitpicker of a reviewer. Thank you Mr. Seward for writing this book and sharing your characters and your creativity with the world. It is an honor to have your work on my site. This is a touching and heartfelt tale of love, loss, and healing. Duck and Trista both have heartbreaking histories and are dealing in their pasts in very different ways...although both methods are similar due to their destructiveness The two are drawn to each other and eventually find they have more in common than they think. I read this entire book in about 4 hours. It started very slowly, but by a little over halfway in I realized I was hooked. I needed to know what would happen to them. My he This is a touching and heartfelt tale of love, loss, and healing. Duck and Trista both have heartbreaking histories and are dealing in their pasts in very different ways...although both methods are similar due to their destructiveness The two are drawn to each other and eventually find they have more in common than they think. I read this entire book in about 4 hours. It started very slowly, but by a little over halfway in I realized I was hooked. I needed to know what would happen to them. My heart was aching for these characters. Their tale captivated me. The character, “Sissy,” was inconsistent. She was Duck’s sister, but acted like his over-protective mother, except when she wasn’t. Her unpredictability bothered me until I realized she was reacting in whatever way helped ease the story along. Then, I simply disregarded her. The story is in need of some editing, as the author seems to like commas. Here is an example: "Sissy, nodded, turned the key, and swung the jeep down the road and out onto Highway 12, headed back toward their little cottage." There are many examples like this, but for the most part this was an easy and enjoyable read. The characters are likable and get under your skin, making you want to know how things go for them after the story is over. On the Outer Banks of North Carolina, while hurricane Renee is about to hit Trista is there vacationing and trying to deal with her tragic loss from five years earlier. There she meets Duck, a man who is also struggling with a tragic past. The two meet and Tirsta hires Duck to take her on his boat so she can find closure. But they do not expect to be on the ocean in the middle of a horrific storm. Secrets are revealed that were buried deep and they affect both of their lives. Together they are about to battle a severe storm, and ghosts of the past. A well written story of love, loss and friendship. I really liked Trista. I could feel her emotions and inner pain, that made her "real", and I empathized with her. Duck was also struggling with his past, and was very likable as well. The story flowed beautifully with suspense, emotions and secrets. I was engrossed until the last page. Two suffering souls meet at the seaside. Neither of them are looking for anything more than survival. How can one move forward without being able to forgive them self? How can one move on while continuing to fight their demons on a nightly basis in their dreams? Trista and Duck have given up on having a productive life. Through tragic events both have lost the will to fight. Duck willingly takes the blame, and hatred, of those around him. Trista longs to reunite at least a part of herself with h Two suffering souls meet at the seaside. Neither of them are looking for anything more than survival. How can one move forward without being able to forgive them self? How can one move on while continuing to fight their demons on a nightly basis in their dreams? Trista and Duck have given up on having a productive life. Through tragic events both have lost the will to fight. Duck willingly takes the blame, and hatred, of those around him. Trista longs to reunite at least a part of herself with her daughter, allowing herself to wallow in pity and sorrow until she can. While Trista is seemingly asking the impossible Duck eagerly takes on the job thinking that he will fail, because he has always done so in the past. It took me a bit to get into the story. It wasn't that I wasn't liking it, but it was a bit slow for a little while and there are some issues with the editing. But after I did finally connect, I was quite drawn in. I really liked how the author gave glimpses of the past to help you gradually understand more of what was going on. It made it easier to feel an emotional connection. I'm also quite a fan of an unexpected ending, so that was a bonus as well. I've had a couple friends who read this book It took me a bit to get into the story. It wasn't that I wasn't liking it, but it was a bit slow for a little while and there are some issues with the editing. But after I did finally connect, I was quite drawn in. I've had a couple friends who read this book and recommended it and I would have to agree, it was a pretty good read. I was lucky enough to read an advanced copy of this novel, and I really enjoyed it! It had the perfect combination of detail-rich characters and a well-delivered plot. This is the perfect book to read on the beach or tucked on your couch with a warm cup of coffee. It has a little bit of everything - mystery, romance, some funny parts that will make you laugh out loud, and some parts that will fill your eyes with tears. I just loved it. True story - I was about 3/4 of the way through Hearts in the I was lucky enough to read an advanced copy of this novel, and I really enjoyed it! It had the perfect combination of detail-rich characters and a well-delivered plot. This is the perfect book to read on the beach or tucked on your couch with a warm cup of coffee. It has a little bit of everything - mystery, romance, some funny parts that will make you laugh out loud, and some parts that will fill your eyes with tears. I just loved it. I really enjoyed this story. It was emotional most of the time because so much was kept hidden by Duck. He carried a lot of guilt, but worked his way through it. Tristan had a lot of guilt also but was also freed. The storm was scary and exciting....the rage of hurricanes can leave a lot of destruction and heartache. I truly enjoyed this story and look forward to reading more of Elmer Seward's work. This was a nice story. It was worth the read. It was hard to put down once I started reading.